After reading this article you should be able to choose the right solution for your company. First of all you need to understand exactly what do you need and what are the solutions the market provides nowadays. The world has tried to automate the data collection for tracking the employee working hours for about 130 years with a certain success. Starting with the early mechanic time clock where the employee had to insert his paper card into the machine to get it time-stamped. 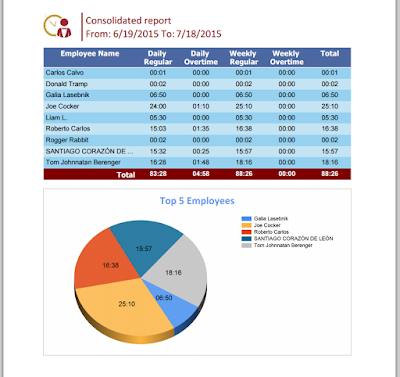 Today we have a vast variety of solutions that may provide a similar result on keeping track of employee's work hours. 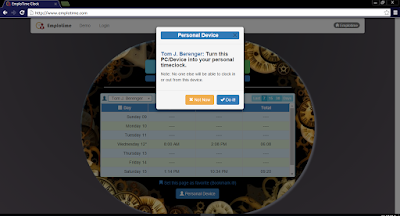 So, the first step towards the selection of the correct solution for you, could be remove all the unwanted old techniques that for sure won't be good for anyone, no matter the company size, budget, etc. The wage laws in the United States and Canada as well as other countries require most employers to pay overtime. 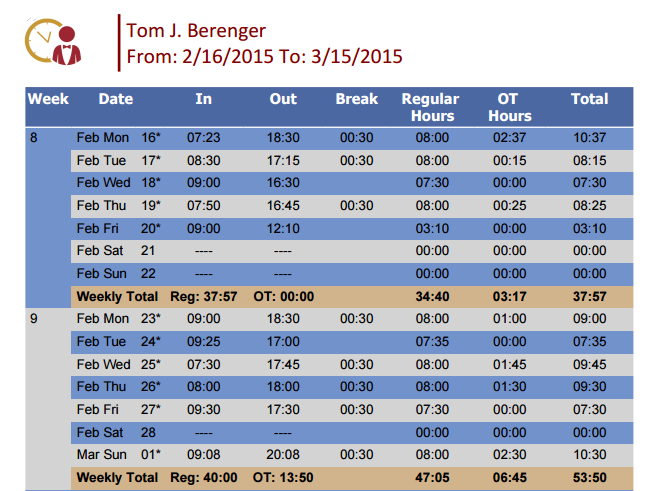 The premium pay after designated hours are divided between daily and/or weekly. It means that (as an example) employees are entitled to receive overtime payment for every hour more than 40 that they work in a workweek or/and more than 8 hours in a day. 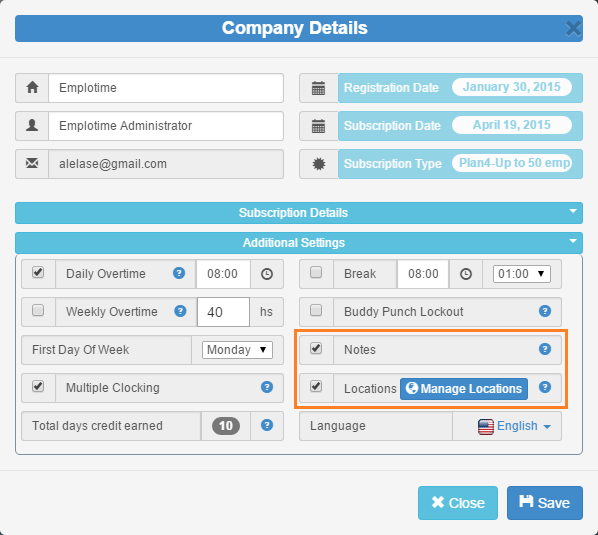 Now, Emplotime provides the possibility to activate Daily or/and Weekly Overtime to get detailed reports with this specified information. After activating these features you will be able to print the following report. 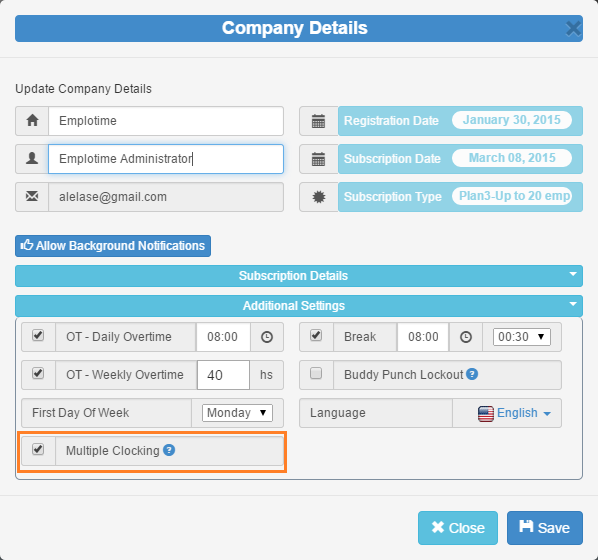 In order to activate one or both of the Overtime features, from the Emplotime Administrator portal, go to Company Details --> Additional Settings , then, check the Overtime checkbox desired and set the overtime threshold. It is important to select the start of your workweek, that is generally Sunday or Monday.